BILLY Castle returned to the snooker tables on which he learnt his craft as a junior to take a step closer to his dream of becoming a professional. The 24-year-old (pictured) moved up to second place in the Cuestars South of England Championship Tour rankings after winning the second leg at Chandler’s Ford Snooker Club. A Q School place and the chance of earning a two-year tour card is on offer to the rankings winner at the end of the eight-leg campaign. 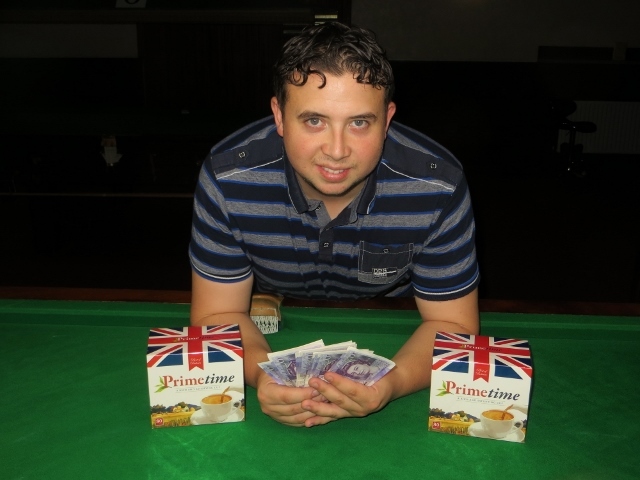 Castle pocketed £200 prize money after accounting for event-one winner Seb Worrall (Swindon) 3-0 in the final that lasted just 38 minutes. “I believe I can be a professional,” insisted Southampton’s former Town Champion. “If I didn’t believe, I wouldn’t go to Q School. “I’ve got the attacking game, not to his heights but very similar to how Judd (Trump) plays. A massive entry of 39 top amateurs from across the south recorded 38 breaks of more than 50 during the Ahmad Tea-sponsored event. Castle’s first visit of the day yielded a run of 112 against Anthony Rice (Fordingbridge) but that was swiftly followed by his Churchills teammate Mike Finn (Eastleigh) firing in a 128 against Emin Thorose (High Wycombe). “I knew if I was in that sort of form I’d be there or thereabouts,” said Castle, who dropped only one of his 20.frames and chalked up another nine half-century breaks. He made 96 and 76 in a 3-1 last-eight victory over two-time rankings champion Matt Ford (Bracknell) and 81 and 63 in a 3-0 semi-final success over Mike Talmondt (Portsmouth). Elsewhere, on his first Cuestars outing of the season, Labeeb Ahmed (Chessington) won his group, beat Richard Clark (Swindon) 2-0 in the last-16 and edged Christian Chislett (Basingstoke) 3-2 on the final black before going out 3-0 to Worrall. Bradley Cowdroy (Bournemouth) was the best performing junior. The 14-year-old won his round-robin group, beat Rice 2-0 in the first knockout round and lost 3-0 to Worrall. Mickey Joyce, a 13-year-old from Basingstoke, went out 2-0 to Talmondt in the last-16. And ten-year-old home player Oliver Sykes earnt rave reviews after missing a doubled pink to beat ex-professional Talmondt before losing 2-1 on the final black in the group stages. Originally from Marchwood, Castle is a three-time winner of the Saturday morning Under-18 League at Chandler’s Ford SC. Now based at The Crucible Sports & Social Club, Newbury, he lives in Reading with wife Betsie and children Kacie-Mai, who was born in August, and 19-month-old Billy-James. 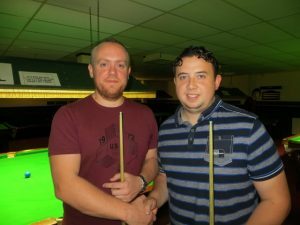 The third leg of eight, sponsored by Sanders Snooker and Pool Table Services, is at Top Spot Snooker Club, Havant, on Sunday, November 13. Ahmad Tea is an international tea producer whose global headquarters and specialised high value products factory is a stone’s throw from Chandler’s Ford Snooker Club. For more information, go to www.ahmadtea.com. Mike Finn: 128, 88, 76, 53, 52. Billy Castle: 112, 96, 81, 76, 65, 63, 59, 57, 55, 50. Labeeb Ahmed: 88, 55, 52. Matt Ford: 65, 62, 60, 57, 57, 56. Bradley Cowdroy: 62, 55, 52. Mike Talmondt: 52, 52, 51. GROUP A: 1st, Bradley Cowdroy (Greenbaize, Bournemouth); 2nd, James Cullen (Woking SC); 3rd, Matthew Stadius (Selsey RBL, Chichester); 4th, Mark Wells (Greenbaize, Bournemouth); 5th, David Rice (Salisbury SC). GROUP B: 1st, Billy Castle (Crucible, Newbury); 2nd, Anthony Rice (Salisbury SC); 3rd, Henry Eastwood (Frames, Coulsdon); 4th, Wasim Khan (Liberal Club, High Wycombe); 5th, Charlie Pringle (Chandler’s Ford SC). GROUP C: 1st, Seb Worrall (Jesters, Swindon); 2nd, Matt Ford (Sunninghill Comrades Club); 3rd, Martin Wallace (Crowthorne RBL); 4th, Connor Benzey (Chandler’s Ford SC); 5th, Jordan Winbourne (Chandler’s Ford SC). GROUP D: 1st, Jon Charlton (Aldingbourne Social Club, Chichester); 2nd, Ronnie Blake (Frames, Coulsdon); 3rd, Mark Lloyd (Stoke SC, Gosport); 4th, Brad Chappell (Greenbaize, Bournemouth); 5th, Ricky Hong Chin (Frames, Coulsdon). GROUP E: 1st, Labeeb Ahmed (Frames, Coulsdon); 2nd, Callum Lloyd (Redz, Cwmbran); 3rd, Neil Herd (Salisbury SC); 4th, Ally Pollard (Salisbury SC); 5th, Reece King (Greenbaize, Bournemouth). GROUP F: 1st, Mike Finn (Churchills, Eastleigh); 2nd, Richard Clark (Jesters, Swindon); 3rd, Emin Thorose (Liberal Club, High Wycombe); 4th, Dan Sykes (Chandler’s Ford SC); 5th, Nick Miles (Ashlett Club, Fawley). GROUP G: 1st, Christian Chislett (Selsey RBL, Chichester); 2nd, Mike Talmondt (Copnor SC, Portsmouth); 3rd, Oliver Sykes (Chandler’s Ford SC); 4th, Steve Wheatland (Chandler’s Ford SC); 5th, Marc Russell (Chandlers Ford Central). GROUP H: 1st, Mickey Joyce (Chandler’s Ford SC); 2nd, Stewart Crosswell (Churchills, Eastleigh); 3rd, James Budd (Fareham SC); 4th, Mike Trigg (Chandler’s Ford SC). LAST-16 (20 points): Cowdroy 2 A Rice 0, Worrall 2 Blake 0, Ahmed 2 Clark 0, Chislett 2 Crosswell 0, Castle 2 Cullen 0, Ford 2 Charlton 0, Finn 2 C Lloyd 0, Talmondt 2 Joyce 0. QUARTER-FINALS (24 points): Worrall 3 Cowdroy 0, Ahmed 3 Chislett 2, Castle 3 Ford 1, Talmondt 3 Finn 1. SEMI-FINALS (£45, 30 points): Worrall 3 Ahmed 0, Castle 3 Talmondt 0. FINAL (£200/£100 50/36 points): Castle 3 Worrall 0.